Livingston forecast survey - Equities almost at year-end estimates - Now what? The Livingston Survey, collected by the Philadelphia Fed, is one of the longest running surveys of market economists on key indicators for the economy. One of the survey questions asked every six months is the expected level of the stock market. The latest numbers suggest that the market will be up six percent by the end of the year but after a strong January, we are already almost there with a return of 4.75 percent for the month. The market at 282.24 is above the level set for the end of the year. The stock market, by this forecast, will have to move sideways for the next eleven months. The survey also reports that 10-year Treasury yields will be lower from previous forecasts at 3% but still higher for the year given a strong January increase. Inflation is expected to be at 2.2% for the CPI for year-end, growth will be lower at 2.4% for Q2-Q4 2018, and unemployment will be 3.9 percent, slightly lower than the current level. The bottom line is that the real economy will be smooth, rates will be higher, and right now equities may be ahead of their forecasts. If you believe in these forecasts, don't expect the same double digit returns as last year. Diversification may be a more prudent approach to asset allocation. Below are the forecasters in the survey. This is a good list of strong economists. 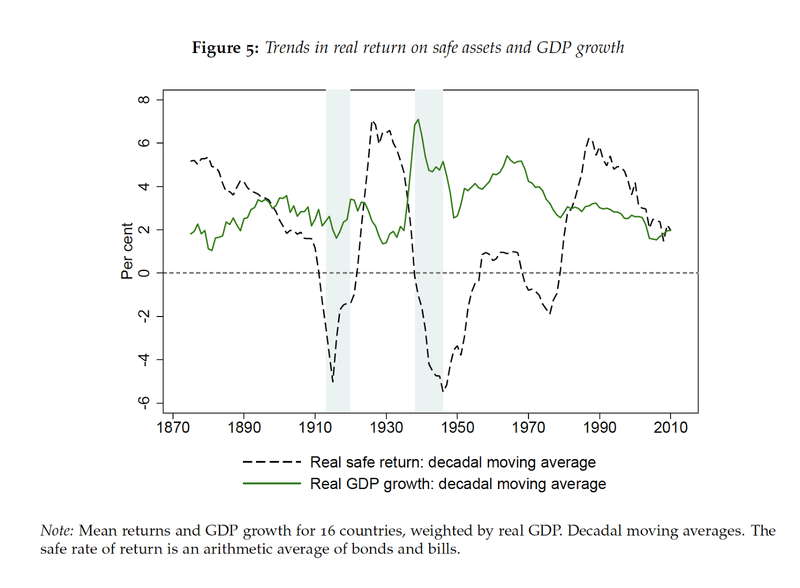 The relationship between growth and equity market returns is not always direct. Equities can move higher because of an increase in earnings growth or from an increase in valuation. Market earnings should increase with economic activity but they may vary across the cycle. Similarly, the relationship between growth and nominal yields also can be variable albeit generally positive. Higher growth may lead to higher real rates, higher expected inflation or a change in monetary policy. The problem is that actual economic growth often has reporting delays so the link with market prices is mixed. The link between prices and fundamentals should focus on leading or forward looking indicators. 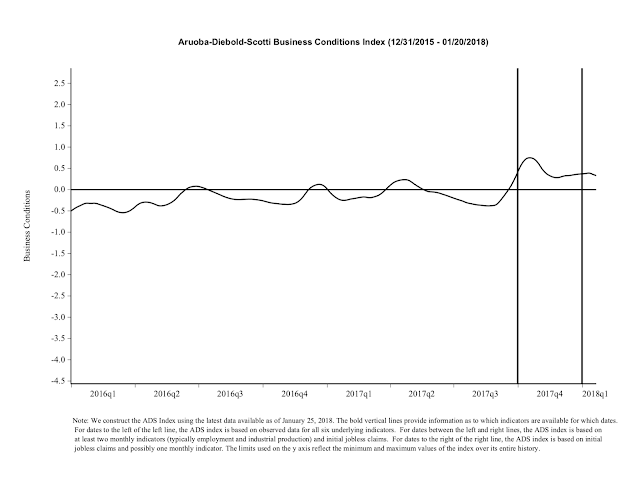 One useful indicator is the Philly Fed ADS Business Conditions Index which blends high and low frequency information as well as stock and flow data. The index clearly exploded on the upside in the third quarter of last year and has continued to stay high even if it is off index highs. These readings are consistent with a strong stock market and a weak bond market. Given it has continued to show positive readings, holding existing stock-bond allocations make sense. Now, the ADS index has given mixed signal since the Financial Crisis consistent with the slower growth in the real economy, but in a more normalized monetary environment, we expect that this index will provide better signals. No one wants to be the holding a bubble asset when the market breaks. It is not pretty given the potential for sharp corrections, but it is hard to say when it is time to leave the party. You could just say you don't want to play the game, but the opportunity cost can be high because the time between bubbles begin and the market reverses can be measured in years. Additionally, with bubble language surrounding equity and bond markets as well as some real estate markets, the world could either be filled with bubbles or the term is being used so loosely that it does not have meaning. A recent paper looks at the connection between volatility and bubbles to see if it can serve as a signal for a coming crash. Some researchers have found a positive correlation between increases in volatility and crashes but the work has not been broad-based. The idea is simple. Higher implied volatility in a bubble market could serve as a signal of dispersion in views and suggests that the one-directional market is coming to an end. The new research, which looks at 40 bubbles, finds no connection between volatility and bubbles. See "Can We Use Volatility to Diagnose Financial Bubbles? 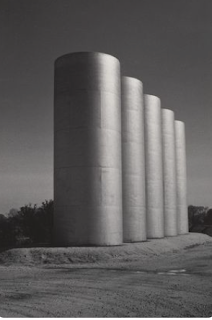 Lessons from 40 historical bubbles" from ETH Zurich. ETH Zurich is now the center of very interesting research on bubbles. What the authors do find is that 2/3rd of the time bubble crashes actually follow periods of low volatility. The markets do not see the crash coming and there is little dispersion of opinion. This should make any investor in bubble-type markets nervous and a reason to avoid. I would also take a different view. If implied volatility is low before a crash, then you can buy cheap insurance at the extremes. Use the fact that volatility is not heightened to your advantage and as an opportunity if you are going to be involved with these markets. 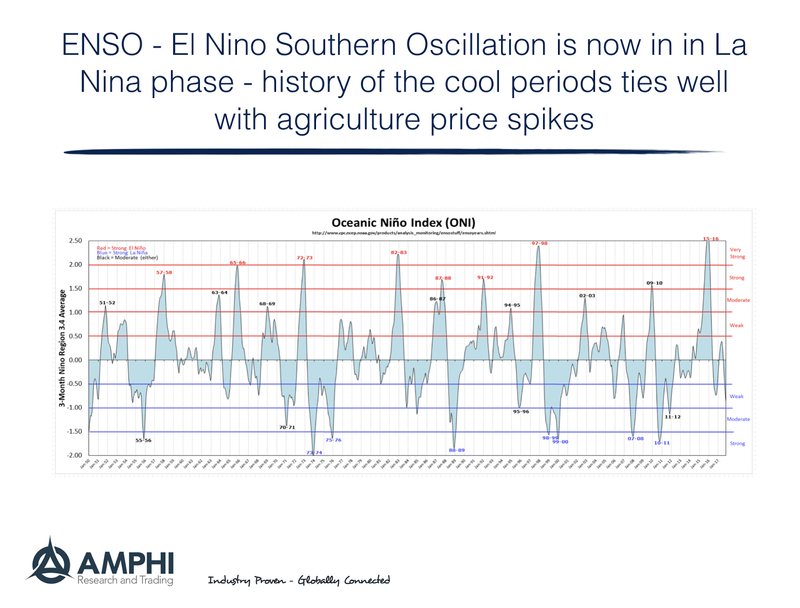 There is the potential for a major agricultural price dislocation if a strong La Nina effect lasts through the summer. 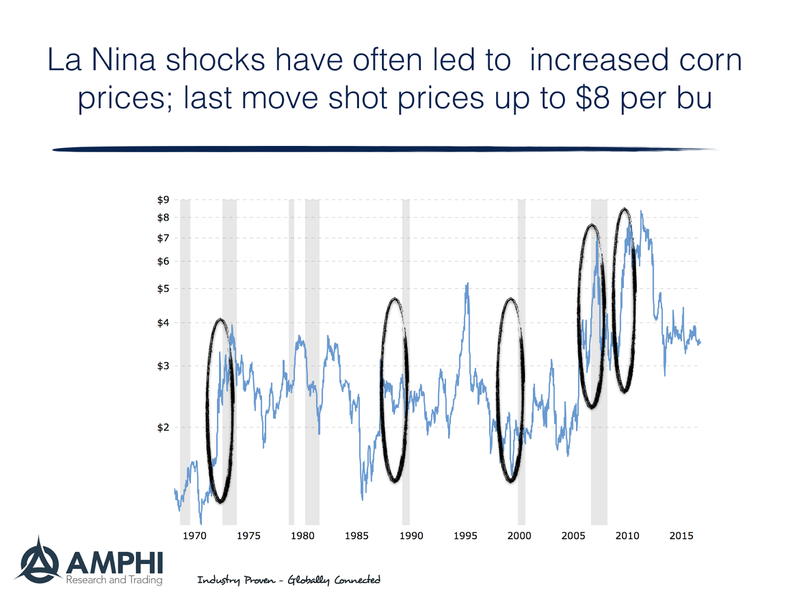 It is unclear whether the current La Nina effects will continue, and current expectations are that it will dissipate in the spring, but history suggests that ENSO effects can disrupt many major commodity prices including corn, soybeans, wheat, coffee, and sugar. So how can investors take advantage of this uncertain opportunity? 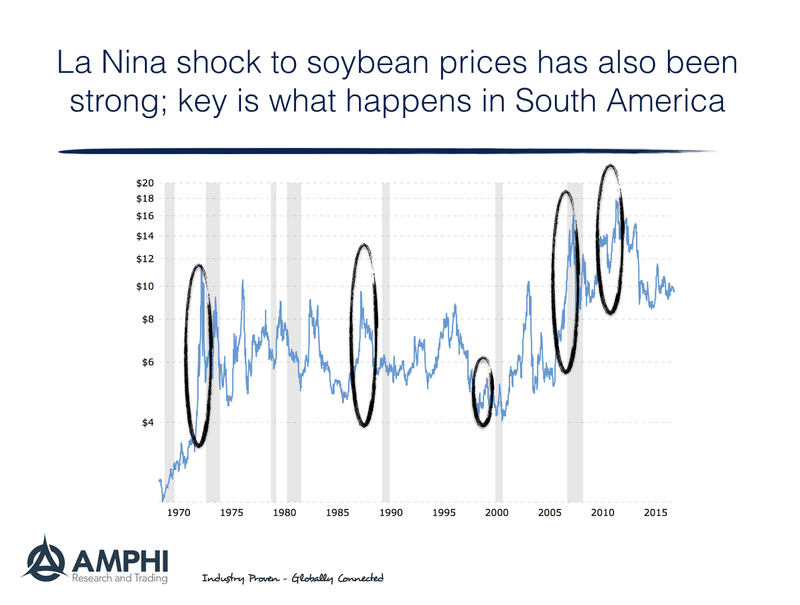 Along with the weather, there are two key variables to follow for agricultural price shocks, the stocks or inventories that are currently held and the market estimates for production. Recent data from the WASDE report shows there is some expected tightening of ending supplies relative to last year, albeit there is still inventory abundance. 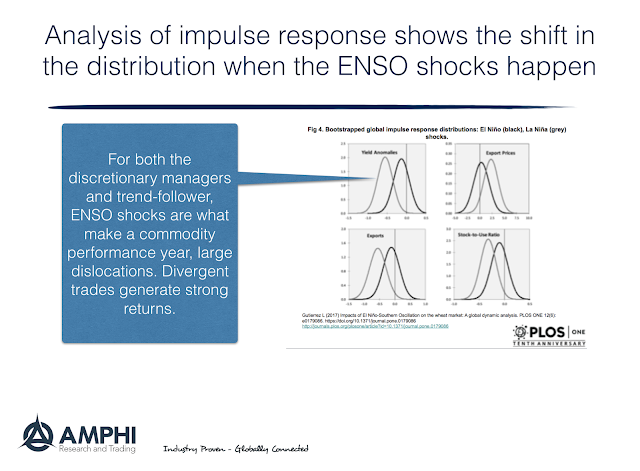 A shock will not matter if there a strong inventory cushion. It may be early to fully handicap summer weather, but it is not too early to set-up a trade especially if it is a trader allocation. 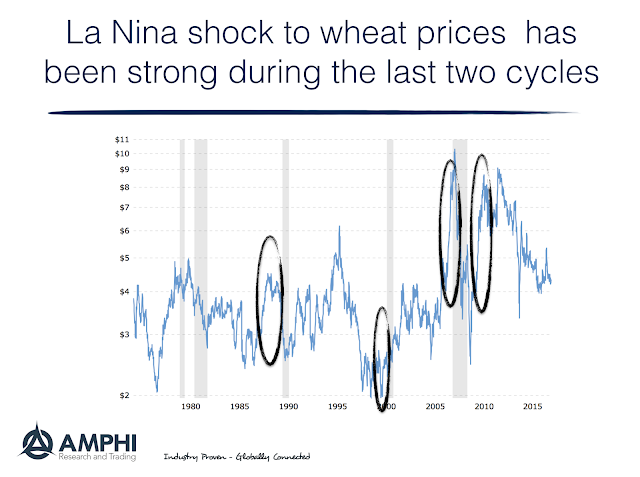 We have reviewed this idea with some leading grain commodity managers who have a mixed picture for the expected price environment at the end of this marketing year for coarse grains, wheat, and oils. However, there is the general belief that a tighter buffer of inventory may allow for more price volatility. 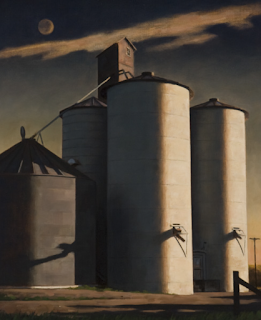 This is why we think the best way to play the grain markets is through a manager basket. Instead of buying a portfolio of call options on grains, the smart play can be buying a basket of active managers where your downside is the correlated loss of the manager basket. A sustained loss on the manager basket will be related to the combined forecasting mistakes of the manager portfolio based on their active bets. Given the unique features of liquid commodity markets, the idea of forming portfolios of active managers to take advantage of defined but uncertain shocks may make sense. As someone who is biased toward quantitative work, it has been difficult to judge the impact of political rhetoric and conflict on market behavior. 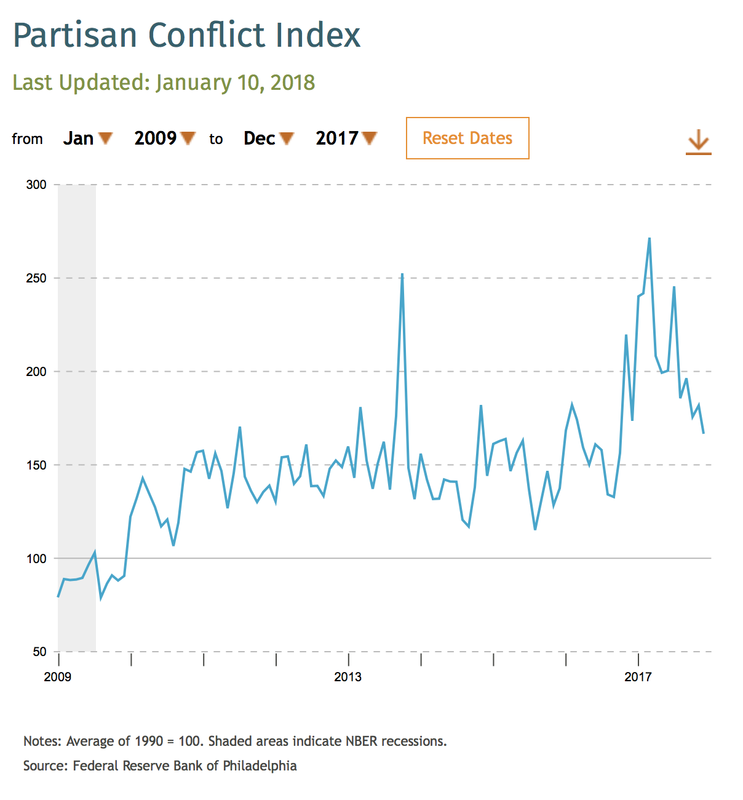 Market uncertainty should increase when there are more partisan conflicts which should translate into higher market risk premiums. Nevertheless, if there is no measure of conflict, this idea cannot be put to a test. 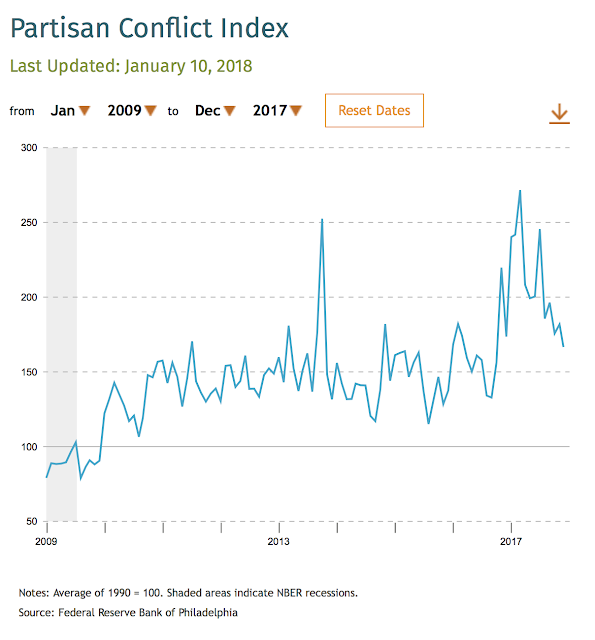 The Philadelphia Fed's research department has developed a Partisan Conflict index and now reports the results every month. The index data can be displayed in an easy to read chart. The index is based on key word searches from major newspapers which may reveal political disagreement. The author of this work finds that there is a connection between conflict and investment, employment, and output. Higher conflict values lead to a discouragement of economic activity. The strong decline in 2017 reverses the large spike around the last election. Current values are still elevated relative to the post Financial Crisis average which has been significantly higher than the longer period from 1980-2009. The caution that many may have had for investing in the stock market during the post Financial Crisis may be the result of this heightened partisan uncertainty. If equity investing is driven by the "animal spirits" of optimism, conflict will dampen risk-taking behavior. This conflict may not be ending, but it may be in the process of normalizing. 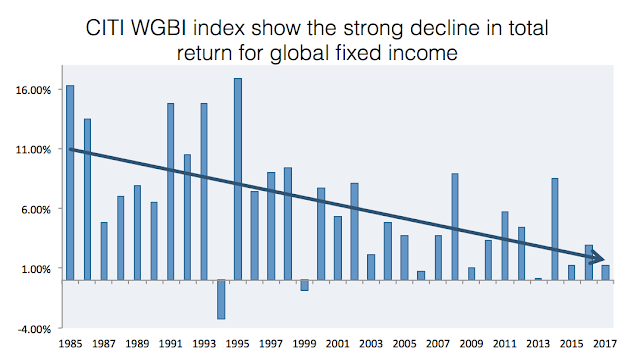 What has been the biggest change in thinking about global macro investing in the last ten years? 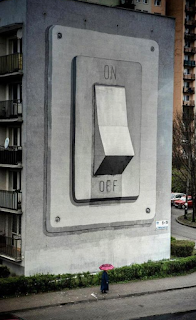 Some could say it is the "anything is possible" view toward central banks. There is now nothing like normal central bank behavior. Others could say that it just the change in macro relationships which has made looking at old price relationship suspect. I would argue that the way global macro managers think about market connections is what is different. 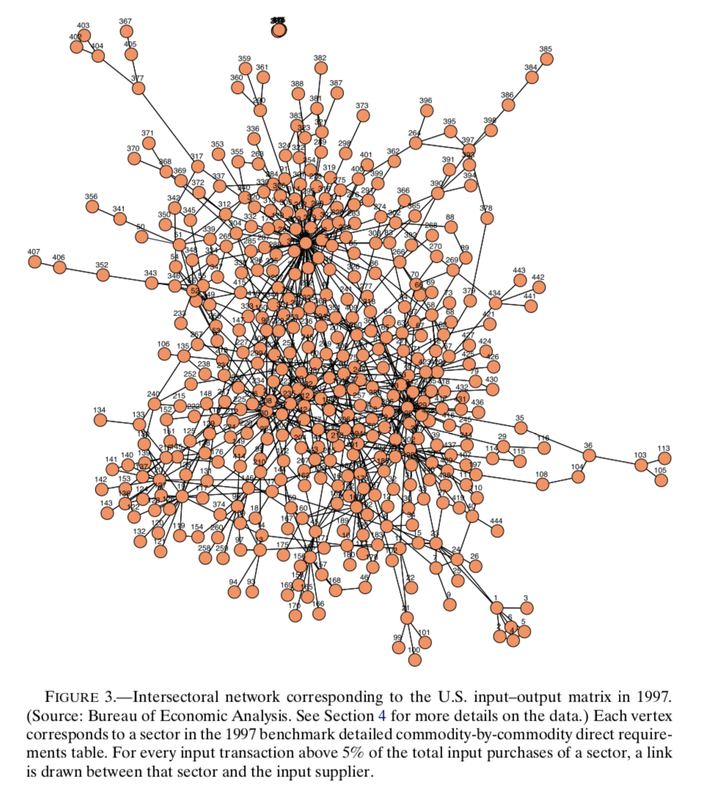 The concept of networks has changed thinking about global macro. The "connectedness" of markets and financial institutions is the new narrative that will drive cross-market relationships. In an extreme efficient markets world, the issue of networks is not really relevant, but in a levered world of cross-market lending, collateral management, banking regulation, and global capital flows, the type of relationships across markets matter. Those managers who understand networking effects will be winners and those that do not incorporate network effects will be losers. This will be especially evident if we have a systemic market shock. The idea of networking effects is apparent across significant amount of macro/finance research. While most of this work has focused on macro prudential and systemic research, it has impact across all macro thinking. See The Network Origins of Aggregate Fluctuations to get a flavor for this type of research. The key problem with this new thinking is translating the idea of networks into operational tools for inter-market connectedness and how cross-market spreads will be affected by it. It clearly will have non-linear impacts that will not be picked up by linear correlation, but how it is used is still being worked out. Some managers have an intuitive idea of how markets are connected, but may not have an operational model. We believe operational models can be developed to help with the process to identify and exploit connectedness that will lead to feedback. At the least, questions with a networking focus can be asked about cross-market effects. Capital requirements and bank regulation - How do regulations lead to cross-market spillover? How do volatility shocks impact market behavior when assets are used a loan collateral? How do ETF flows impact price behavior? How does capital flow from global banks into EM markets impact currency rates? Forget linear correlation and think non-linear networks and connectedness. 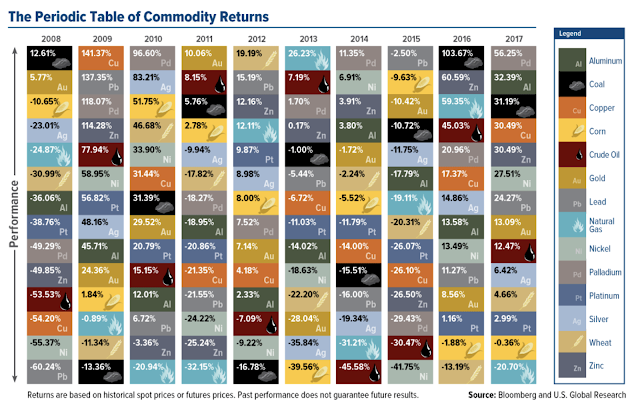 Volatility in commodities as measured by their dispersion in returns is high, so it is hard to characterize the behavior of the commodity sector. The periodic table of annual returns highlights the varied behavior of these markets. This list does not even include softs, tropicals, or livestock commodities and is tilted to the base metals; however, the story would still be the same. 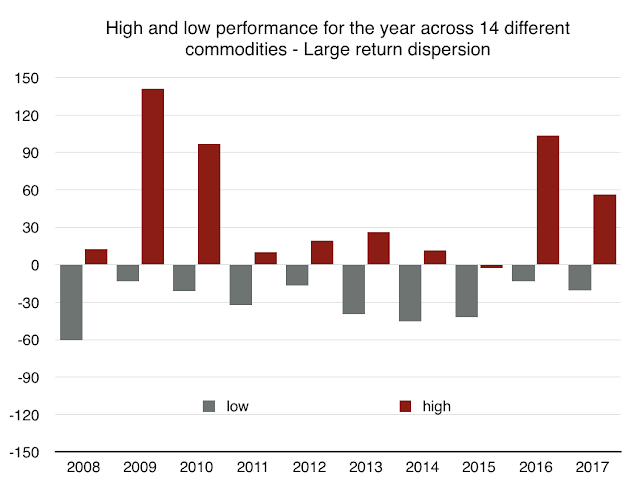 It is not unusual for the annual return dispersion to be over 100% between the lows and high commodities. It is also unsurprising to see the top gainer in one year to fall to the largest loser the next year. Given these large differences in behavior across commodities, there is a fair amount of specialization with commodity hedge fund managers. 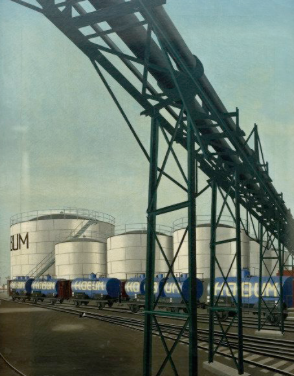 There ill be focused funds that only trade oil and do not trade any other sub-sectors. Hence, commodity trading by hedge funds is fragmented and the size of managers is often smaller than what would be found in other asset classes. Investors are more likely to need specialized skill in assessing commodity trading talent, or at least there is more knowledge required to understand market dynamics. Portfolio building is more likely to involve bundling a set of managers than picking one overall commodity specialist. Knowledge is the Treasure, but Judgment is the Treasurer of a Wise Man. He that has more knowledge than Judgment, is made for another Man's use more than his own. My father used to tell me that brains are like muscles: they can be hired by the hour. It is character and judgment that are not for sale. Markets are efficient in the sense that it is hard to generate excess returns. 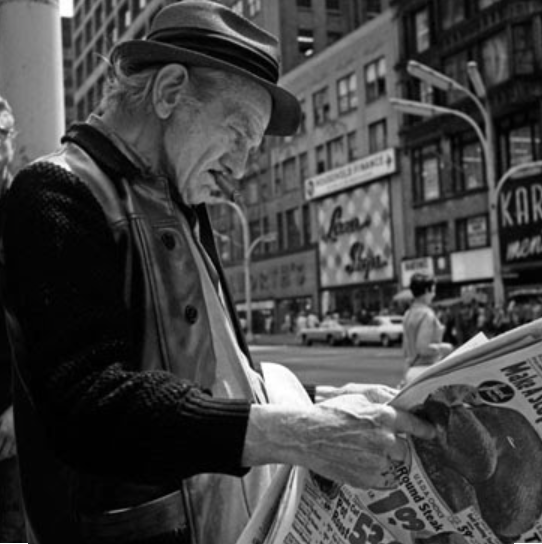 Information is readily available and employed so there is an immediate reaction to any new information event. There are very few funds which have to ability to obtain new information, certainly not legally, or create new information. A recent exception has been using news story counts and twitter hits as a source of data, but the number of firms employing these strategies has increased significantly in the last few years. The quality that separates managers is not data but the judgment on how to use or manipulate data to tell a better forecast story than what is discounted in market prices. 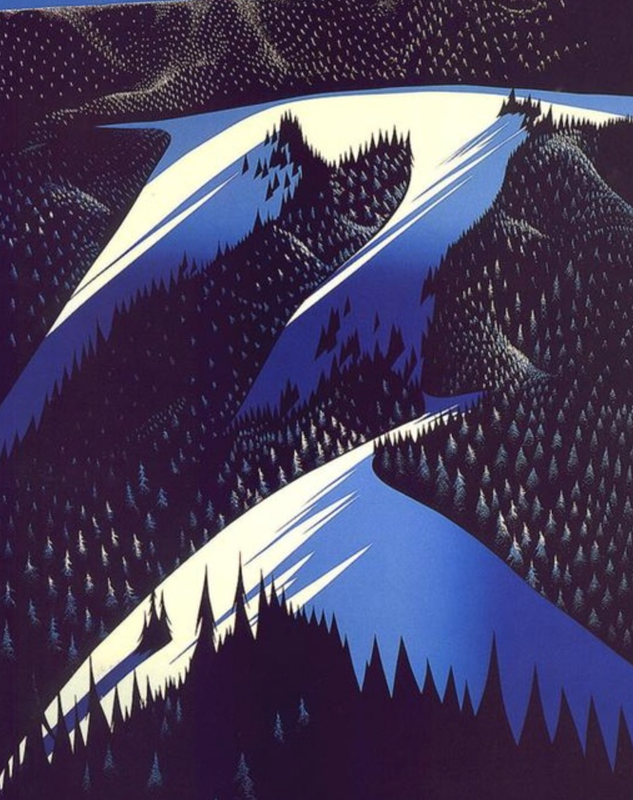 A key part of judgment is the assessment and weighing of facts in order to tell a coherent story of what may happen in the future relative to the opinion of others. So what makes good forecast judgment? It could be quantitative or discretionary, but it is founded on the interpretation of facts not the gathering of facts. 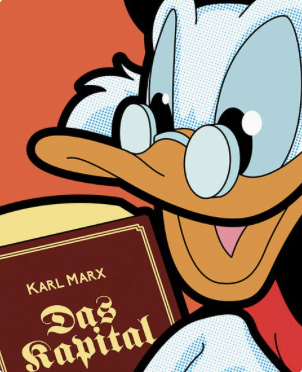 For interpretation, there is a need for a philosophy or view on how the world works. Many can have facts but the assessment of these facts is the value-added skill. The assessment or narrative with the facts, however, is not enough. There also needs to be a decision and action. An assessment without action is of no value to the investor. The assessment has to be converted into a decision which one can call a bet and the action of taking the bet and placing it in the market. Along with the action, there needs to be a review and feedback. A manager' skill is not just taking the same bet when given a set of facts but learning if the markets have changed and adjusting so the decision process or judgment is improved. 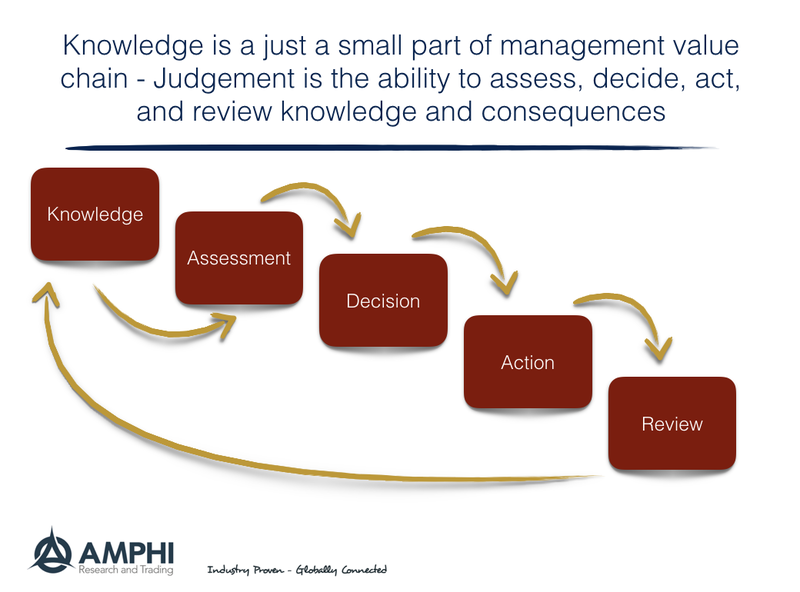 The triplet of assessment, action, and review is the manager's judgment and the skill for which investors should pay. Hence, the focus or assessment on skill has to be on the judgment value chain. 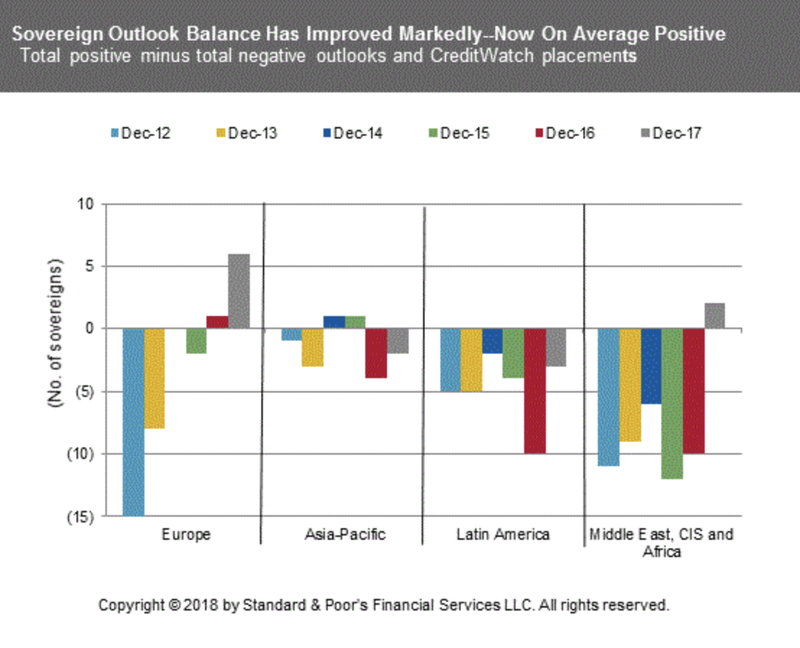 A year ago the market was concerned about global credit risks. 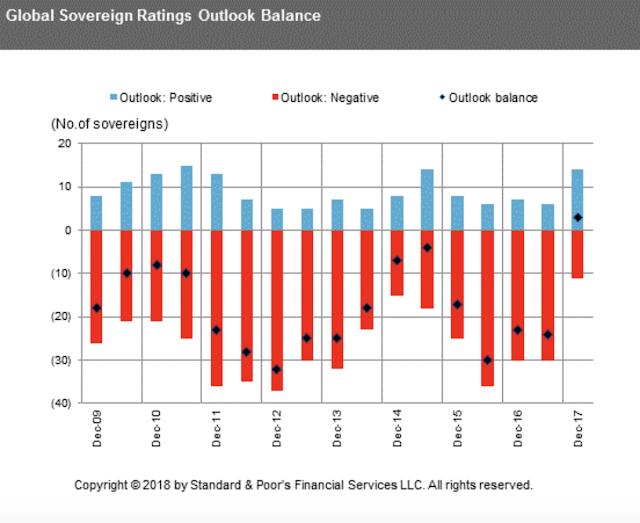 The sovereigns with a negative outlook were high and the number of positive outlooks was low, but that has changed in one year given the improvement in global growth. The number of negative outlooks is at post Financial Crisis lows, the positive outlooks are high and the balanced outlooks are positive for the first time. The balance has improved markedly across regions but especially in Europe and the Middle East. The chance of default risks has fallen given credit quality is improving. Nevertheless, the pricing of credit is still tight. The upside potential for spread widening relative to spread tightening is still high, but investors may have to wait for the credit-widening event. With growth strong, risk-on sentiment still high, and credit/liquidity not biting into behavior, there still is a reason to hold credit exposures. Carry-on. Complexity Bias and Trend-following -We have a bias towards complexity yet simplicity should be preferred. Faced with two competing hypotheses, we are likely to choose the most complex one. 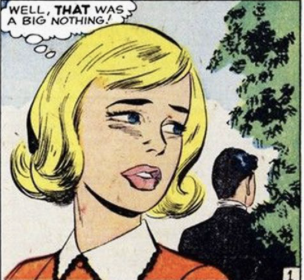 That’s usually the option with the most assumptions and regressions. As a result, when we need to solve a problem, we may ignore simple solutions — thinking “that will never work” — and instead favor complex ones. Most of the behavior biases that have been used to explain investment decision frictions have focused on the idea that mistakes are made because investors engage in fast thinking. Rules of thumb are employed in order to make decision shortcuts, but simplified decisions lead to mistakes. Yet, there is such a thing as complexity bias. With complexity bias, if someone can choose between the simplest answer and the most complex, there may be a bias for something that is more complex. 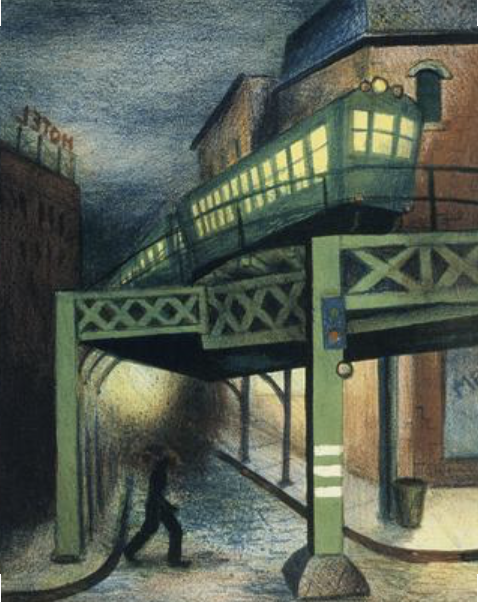 Many have a fascination with stories that seem to have a high-level of complexity. We seem to prefer explanations that are more complex. We often associate complex language with higher level thinking. 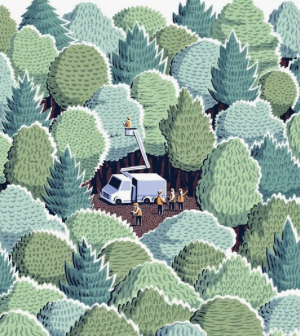 The idea that we often try to find patterns in random events could be attributed to the idea that we like complexity. I have reviewed the literature on this bias and am not persuaded on whether this will supplant the classic rules of thumb bias thinking, but I can see how this bias can have an impact on behavior. The richness of our human biases is truly fascinating. I will, however, use my experience in the trend-following space to conclude that the complexity bias is alive. There seems to be a bias toward complexity in model building. Investors can have a choice between a manager that has a simple model and one that uses "state-of-the-art" statistics and requires a Ph.D. and many investors will go for the complex. A manager comes into an office and talks about his use of complex tools for extract unique and special signals and many will be jumping across the table to invest. 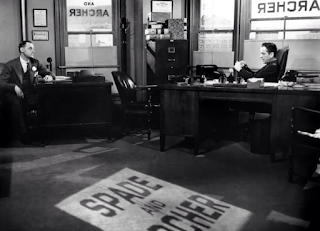 Another manager in the extreme says, "I don't try to predict, I follow trends and buy what is going up and sell what is falling" and it is a short meeting as you usher him to the elevator. Investor need to focus on why complexity is needed and if a manager cannot explain the need, lean toward the simple. If two managers have similar returns, choose the simple strategy. Using better techniques to find improved signals is a worthy goal. Difficult problems may require better tools. Nevertheless, there should be a premium on the combination of results and simplicity; no more rules or techniques than what is necessary. 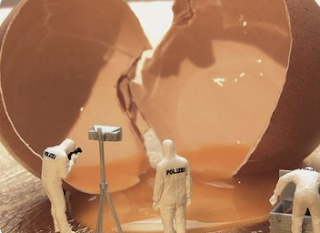 The Occam's Razor of model-building should apply; just the right amount of rules to do what is required, just the most direct technique to find a solution. Crypto-currencies are in strong market downturn with a 40% decline in the last month and more than 20% in a single day earlier in the week only to be followed by strong gain of more than 30%. There has been a wide amount of buzz about bitcoins, yet this decline has not really impacted other financial markets. What is clear is that bitcoins are not integrated at this time with other financial markets so there are limited network effects. It is important to start to think about network effects and social networking is not the same as networking of financial markets. What separated the Great Financial Crisis was the networking of leverage, financial institutions, and product distribution. When networking of financial markets is high, there will be spill-over effects that impact multiple markets. A bank that is stressed can impact a broad range of financial markets based on their lending arrangements. 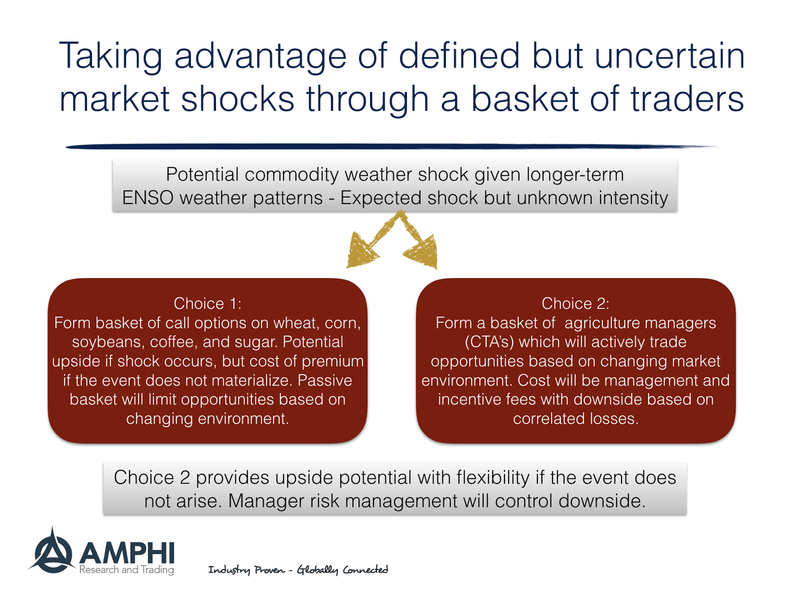 A shock in one commodity can affect lending and risk-taking across all commodity markets. A financial shock that is not networked across markets will have limited impact outside of the immediate participants. In the case of crypto-currencies, there are strong social networks with talk on social media, but there is limited leverage and connection to financial institutions. Hence, a bitcoin shock will make news but will not impact the financial wealth process. This is important because I believe the "new global macro" thinking is more focused on understanding network effects and how they may affect cross-market price relationships. Understand the networks and you can exploit changes in correlation. Global financial markets performed very well but you could not tell by looking at the volume of trading on futures exchanges around the world. The year-end numbers from the Futures Industry Association (FIA) show that futures trading volume was down over 6%. 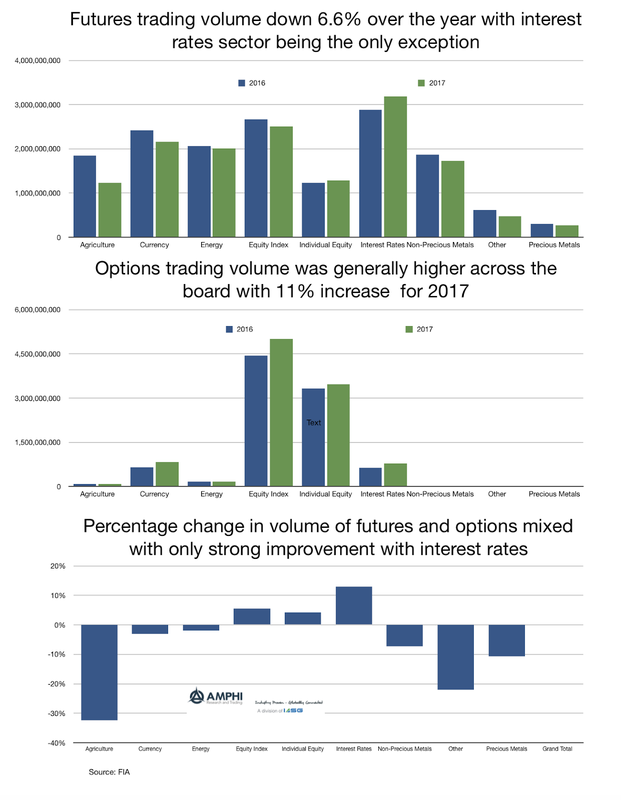 Options volume was up 11% and overall futures and options volume was flat for the year. If there is no volatility and one directional markets, there will be less trading. 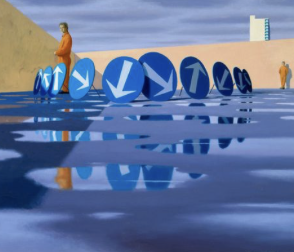 There needs to be uncertainty for speculators to make bets based on disagreement of expectations and there needs to be a reason for hedging for hedgers to trade on the futures exchanges. The only exception for the low trading volume was in the interest rate complex. If the Fed is normalizing, there is now a two-way market for hedgers and speculators which leads to more trading volume. Eurodollars are making a comeback with trading. In option land, the big increases in volume have come in the equity index sector which saw fear in some institutional investors who wanted to buy cheap protection against a downturn that has not yet happened. There also was stronger option trading value in currencies and interest rates based on the move to Fed normalization. Expect a greater increase in volume for 2018 with the move to normalization by central banks continuing and a potential for more two-way trading in equity markets. Our view that the world will become more normal which means more peaks and valleys in market prices that will lead to increases in trading volume. 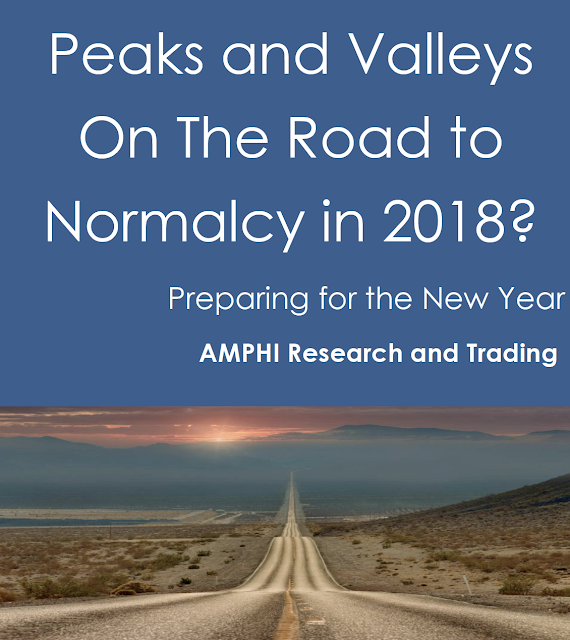 See AMPHI Research and Trading - Peaks and Valleys on the Road to Normalcy in 2018? An optimizer will give any asset an allocation if it is uncorrelated with other assets. This is one of the key takeaways I learned from a new paper called "The Case for Bitcoin for Institutional Investors: Bubble Investing or Fundamentally Sound" by Jim Lieu and Levar Hewlett. I am not against new research that tries to apply classic techniques and this paper does a sound job of showing how bitcoins could be added to a portfolio and adds diversification. But, it is a stretch to conclude that just because it is uncorrelated it should belong in a portfolio. The authors show that bitcoins have a volatility that is greater than large cap stocks by a factor of 20 but still has an information ratio of over 1. This is before the run-up of the last few weeks. 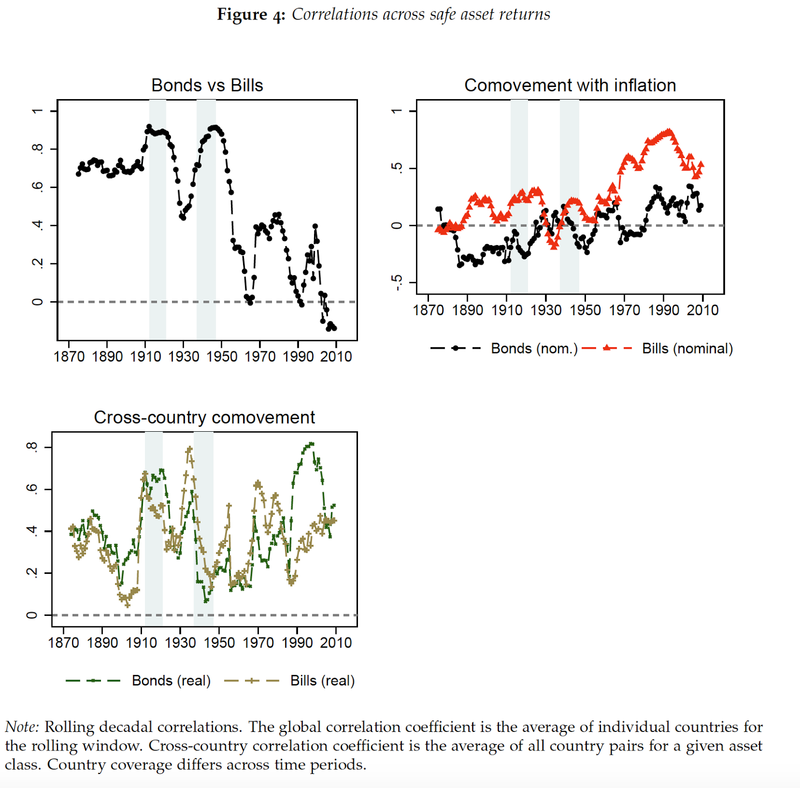 Surprisingly, as seen in the table below, if you want diversification through negative correlation, stick with long bonds. The authors show that holding bitcoins (BTC) would have improved the performance of 60/40 stock/bond even if the allocation was only 2%, but that does not mean it should be added to a portfolio. What is the fundamental economic thesis for any investment? Why should it make money? Why should it have a different return stream than other assets and strategies? Is there a theoretical reason for its diversification properties? If you don't have good answers to these questions, don't use an optimizer to make the portfolio decision for you. 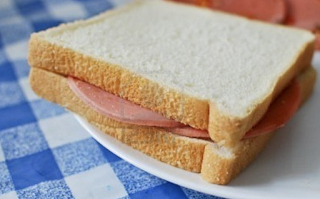 An investment is not a "ham sandwich" that will always fit into a portfolio. The new paper, The Rate of Return on Everything, 1870-2015, a tremendously informative research piece on long-term rates of return also happens to address one of the key issues concerning the cause of inequality discussed by Thomas Piketty in his book Capital in the Twenty-First Century. Piketty draws the provocative conclusion that inequality grows over time because the rate of return on wealth is higher than the growth of GDP. Wealth accumulates to those that have it and not to those that try and ride the wave of GDP growth. Given the positive discrepancy between "r", the return on wealth, and "g" the growth in GDP, the gap of inequality will only grow over time. 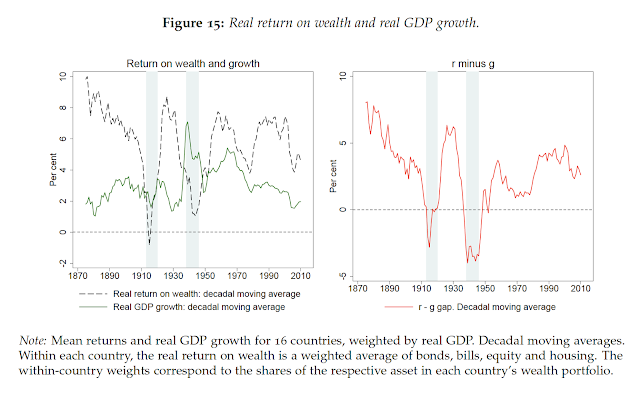 "The rate of return on everything" shows that "r" is greater than "g" by a fair margin, but there are extended periods of negative returns and the return on wealth is highly variable. If you want to join the wealthy class, you have to save to have money to invest. As important, you have to control your wealth return to ensure you don't lose your wealth. Inequality is a problem but wealth-holders take on risk and the certainty of gains are not guaranteed. The new paper The Rate of Return on Everything, 1870-2015 is a mammoth piece of research on gathering information on rates of return back through history. It seems like such a simple issue but producing this work required painstaking and diligent focus on obscure databases. This work is not often rewarded in the economics profession yet has powerful use. I want highlight some of the graphs which can be very helpful for making long-term judgments on the return direction for financial assets. 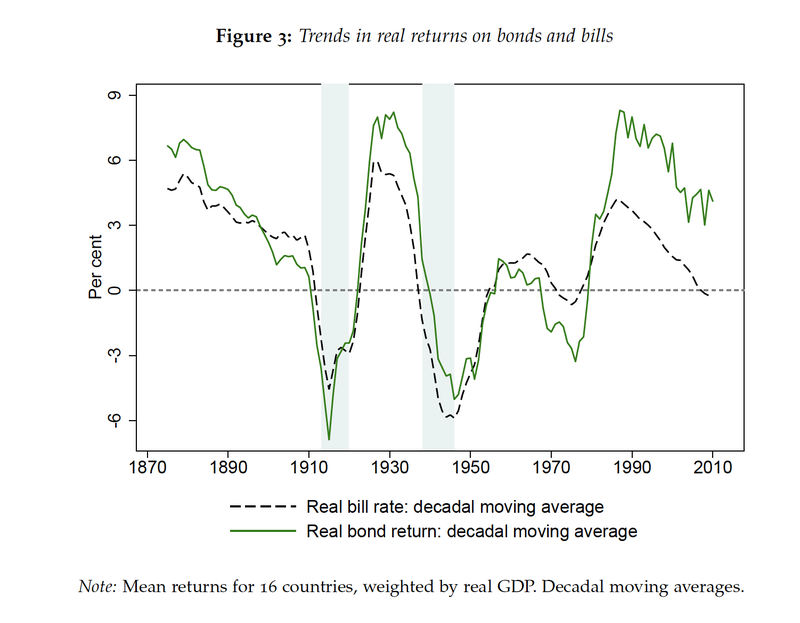 The first graph focuses on the real rate of return for bonds and bills over the last 100 plus years. High real rates of return on bonds are unusual with only three relatively short periods of real returns over 5%. The same can be said for the safe asset of short-term bills. There are long periods where the safe asset will generate negative return. However, the truly negative periods are tied with global wars when there is no safety with financial assets. On a real basis, there is no safety in the safe asset. We can expect that bills will have returns that hover around zero or less most of the time especially in the post WWII period. Also, don't expect much from your bonds going forward if you use history as a guide. Real rates are unlikely to go up toward 1990's levels. The correlation between bonds and bills has historically been much higher and current levels are at all time lows. The co-movement between bonds and inflation has been on an upswing. The cross-country co-movement for both bills and bonds is usually positive but can have some very large fluctuations; nevertheless, there can be value with playing carry around the world. GDP growth over the period of analysis has become less volatile albeit trending lower, but the real returns on safe assets, the average of bonds and bills, have seen significantly more variation that seems independent of GDP growth. The big take-away is that no asset is safe and no minimum return can be taken as a given. Long-term investing cannot be solved through simple allocation formulas because what is supposed to offer protection may not do it and real returns can go through long periods of poor performance untied to long-term growth. There is significant variation across countries, so the idea of a safe global asset may also be misplaced. In an unsafe world even with the assets that are supposed to offer protection means that vigilance tied with active asset allocation choices must be considered. Inflation is becoming a greater concern with many investors, but forecasters are more mixed with their views. The latest CPI number posted a 2.1% year over year change and the core CPI showed a 1.8% change. CPI has been above 2% for 8 of the last 12 months; however, both the CPI and core CPI changes were higher last January. These numbers are stabilizing at a higher level around 2% although there is not a run-away threat with the actual numbers or market expectations. For investors, the question is whether to trade against expectations or stay the course with an assumption of moderate inflation approaching and hovering around 2%. 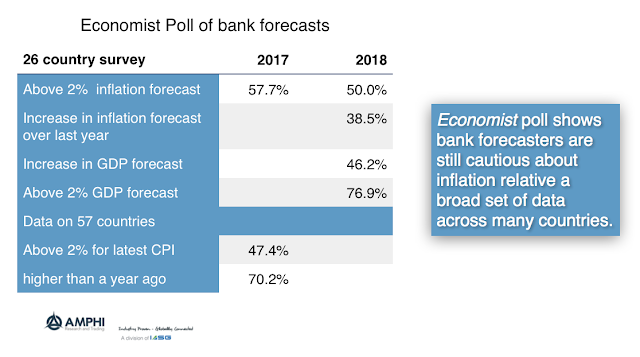 The bet can be place in global context through looking at the Economist Poll of bank forecasts for 26 different countries. 50% of the forecasts are for inflation to be above 2% and 38.5% of the country forecasts show an increase over last year. Less than half the country forecasts show an increase in GDP growth; however, just over 3/4ths expect growth above 2%. The actual inflation numbers of a broad survey of 57 countries show less than 50% having inflation above 2% but 70% have inflation higher than a year ago. Markets expectations concerning growth during the second half of the year were biased low. The low growth forecasts errors will likely carryover to inflation. Based on stronger growth and the lagged impact of any liquidity tightening, inflation across a broad set of countries will be better than 50% and our estimate is that over 2/3rds of countries will see a further increase in inflation over last year. Is research from Wall Street biased? My impression is that it is affected by a host of incentives including not being out of step with peers, pleasing management, and just not making a mistake. You cannot understand the forecast until you understand the man making the forecast. Does the analyst have an incentive to be biased? What master does he serve, the money manager client or the firm's traders and banking clients? Incentives matter and whenever you talk with someone in money management, you have to assess the incentives of the speaker. Given the potential for bias there is a need for regulation in order to further transparency. The positive impact of MiDIF II is that it changes the incentive structure for research. Money managers will have to pay for research directly and will ask for a return on that investment for the fund and for clients. Analysts will be beholden to the quality of their work not a myriad of alternative incentives. Similarly, when a hedge fund pitches an investor, there is also bias? Will a hedge fund ever say that it is not a good time to invest with their fund? Will a hedge fund manager admit failure or mistakes? Will hedge fund managers have an incentive to close a fund or return money? It happens, but should it occur more frequently? 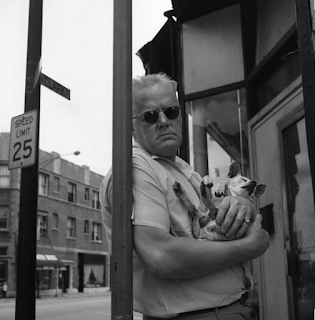 Even good managers and researchers can be unconscious biased toward their point of view. It is the burden of the investor to determine the incentives of the fund, its degree of bias and whether it is clouding the advice given. AMPHI Research and Trading - Peaks and Valleys on the Road to Normalcy in 2018? 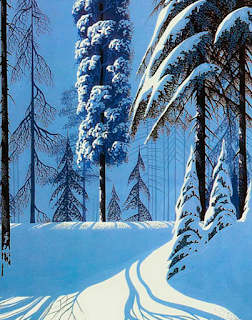 A return to market normalcy is not the same as a calm market environment. Normalcy will bring more peaks and valleys for all financial markets. You won't need a major equity or bond sell-off to see more risk and opportunity in 2018. There are seasonal weather patterns that will ebb and flow during the year bringing volatility to agricultural markets at regular times. However, the longer-term impact on supply can at times be limited. There is noise around production numbers but inventory can serve as a cushion. 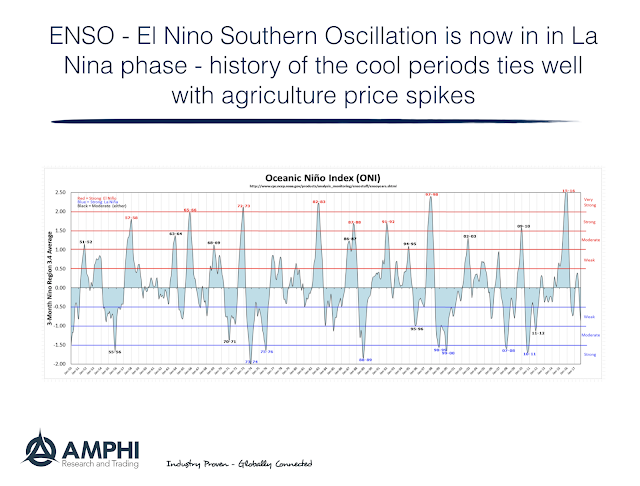 Longer-term weather patterns like the El Nina Southern Oscillation (ENSO) can have a much greater impact and cause significant price dislocations. The weather impact may last for a full year or more. 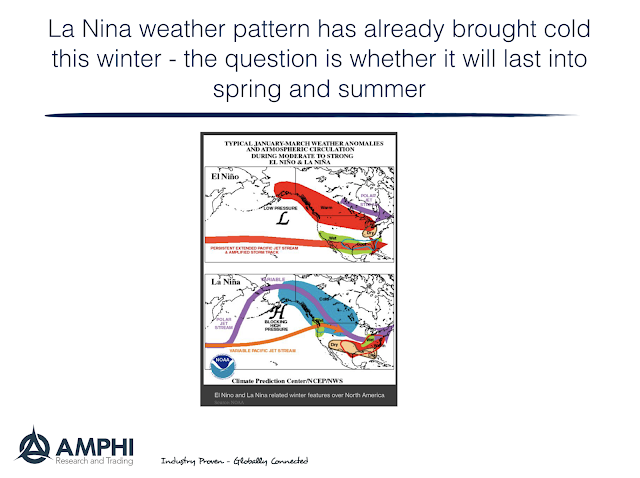 La Nina, a cooling pattern in the Pacific Ocean, has returned this winter and it can have a significant impact on agriculture markets if it continues into spring and summer. 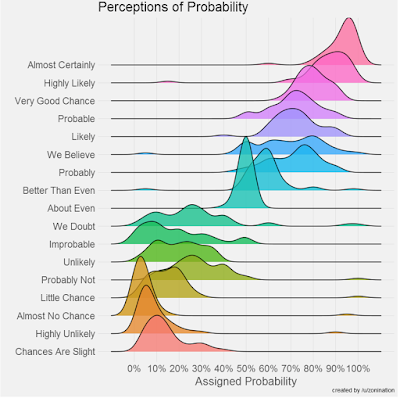 I love this reformulated graph on the old work by Sherman Kent on the potential futility when using language to describe probabilities. There is a lot of ambiguity in the meaning of certain terms. 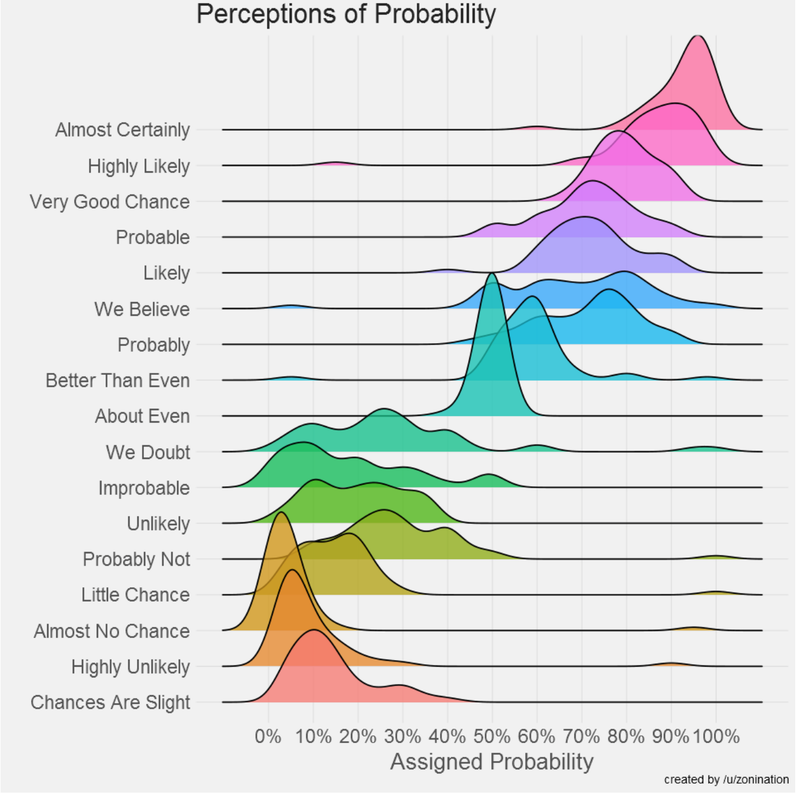 One man's doubt is not another's "little chance" and one man's "likely" is not another's "probable". If you use words, back them up with some numbers. One of the most important features of the move to quantitative investing is the level of precision that can be associated with portfolio decision-making. The precision is not with a point estimate of what will happen but with the ability to generate a distribution around the any estimate. When the comment, "this is risky", is used, it has meaning. Recommendations or ideas have contextual meaning when they are risk-adjusted. A new year's resolution for your next investment meeting or when a manager comes into your office and they say "we believe ...", should be to ask them to assign probabilities to what they are recommending. That should be an interesting experiment. 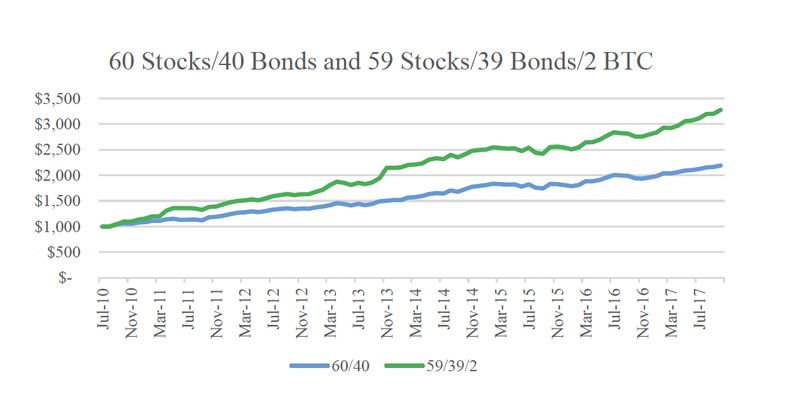 The 60/40 stock/bond blends both domestic and international generated double digit returns on strong equity performance. The majority of the risk came from the stock allocation which make them sensitive to any market reversal. Risk parity programs as measured by the HFR index series also provided good returns in 2017 with performance that matched or bettered the more traditional dollar weighted portfolio. 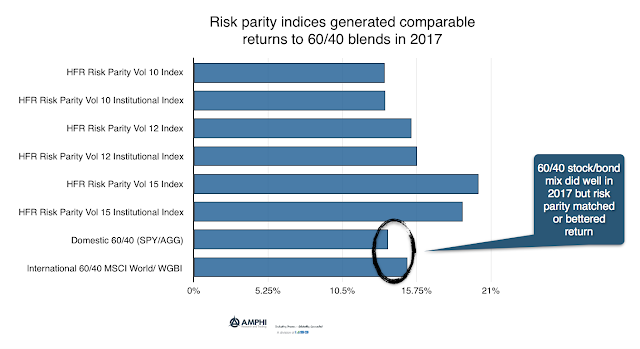 This risk parity approach offers an alternative asset allocation weighting scheme in an overall market where equities are overvalued. We have argued that risk parity has some macro flaws. These programs will be sellers in a risking volatility market which may create negative feedback loops, but the idea of allocating across a broader set of asset classes and employing schemes that move away from asset class dollar weighting have merit. Most global macro and managed futures have risk parity features which ensure asset class diversification. There is a powerful drag on fixed income performance. Low interest rates beget low returns since bond returns consist of the current yield and the change in price. Currently, the WGBI yield to maturity is 1.26 percent and the modified duration is 7.77 years. Lower yields also mean there is less cushion for protection from a rise in rates. We know that rates can turn negative which can support better price returns, but again there will be lower or no carry from holding bonds. The inherent price risk is higher even if volatility is lower given the extension of duration at low rates. No carry and more duration risk means that there is a need for other safe diversifying assets. More importantly, if there is no current yield, there needs to be diversification beyond just holding asset classes. In an overvalued equity and fixed income world, the only help for investors is to diversify across factors or time varying risk premiums that can be exploited through active decision-making. 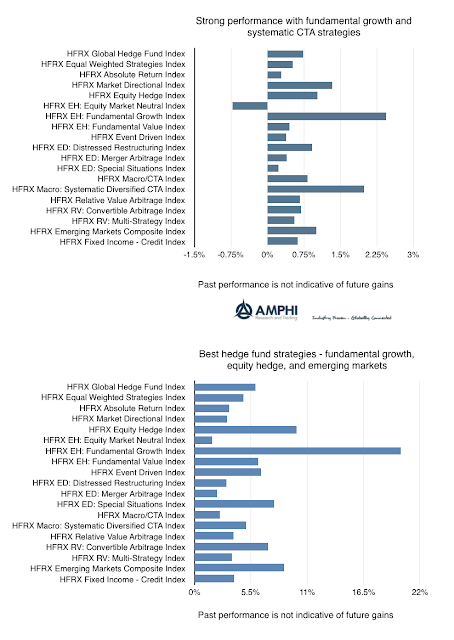 Strong year-end performance for hedge funds as measured by HFR indices was led by the fundamental growth and systematic CTAs categories. It is notable that the systematic CTA index performance from HFR was greater than what has been reported by other index providers. Generally, funds moved higher with the stronger equity beta. Given the decline in correlation across stocks, we have seen an increase in equity hedge fund alpha production. Performance for the year was positive for all hedge fund strategies with the average return being 5.78% and the median equaling 5.99%. The high for the year was with the fundamental growth index which returned 20.13% while the low was with the market neutral index at 1.73%. The standard deviation for the index universe was 4.19%. 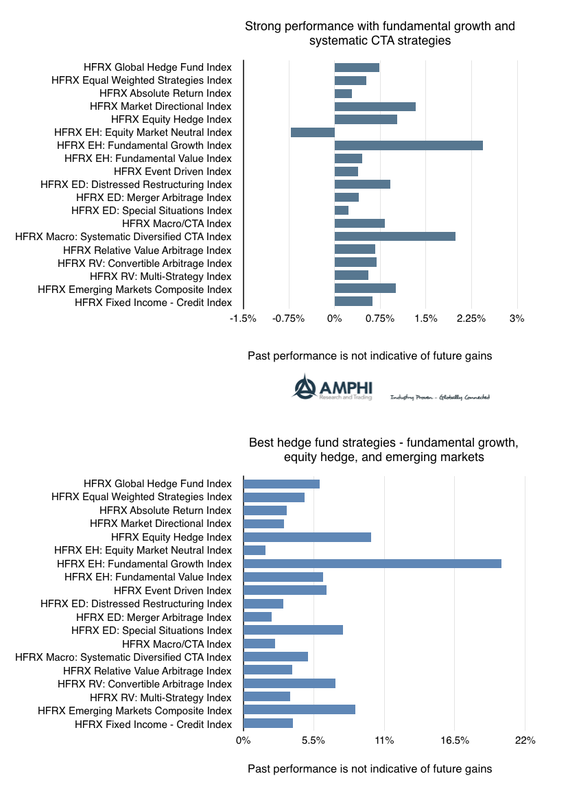 We were a little surprised that equity hedge funds were not able to generate better returns for the year from a combination of beta and alpha exposure. With equity indices generating 20% for large cap, there was plenty of upside return; however, many hedge funds engage in value and small cap trading which did not do as well as the more liquid large cap stocks. 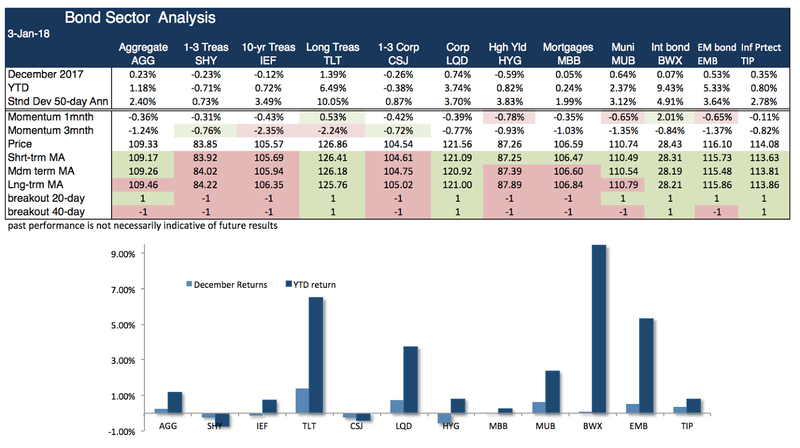 Credit and fixed income was more in-line with beta alpha combinations. 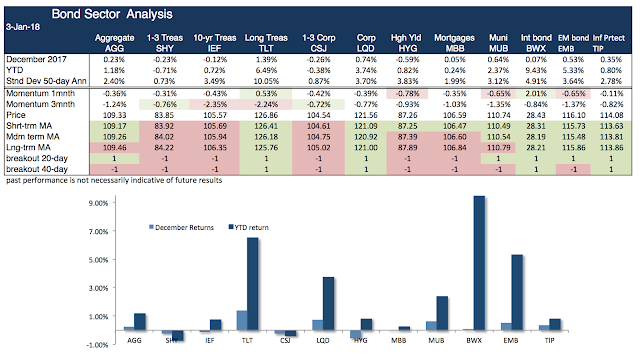 Systematic CTAs were able to generate good returns in the fourth quarter. Given the low to zero correlation with stock indices, the systematic mangers, who often focus on trends, were somewhat consistent with expectations. 2018 will be a testing year for hedge funds. On the one hand, higher dispersion across stocks will offer more alpha opportunities, but the high overvaluation with the likelihood of a market turn-around may prove difficult for managers to exploit. In the short-run cautious behavior may not be rewarded. For macro managers, the combination of central bank policy dispersion and economic growth impacting currencies and commodities may lead to more opportunities throughout the year. A year-end performance review of styles, sectors, and country index ETFs shows the peaks and valleys for 2017 and what may be ahead in 2018. Overall, this was an especially good year for international investing and holding exposure in emerging markets. Large cap US which has strong international earnings also did well in 2017. 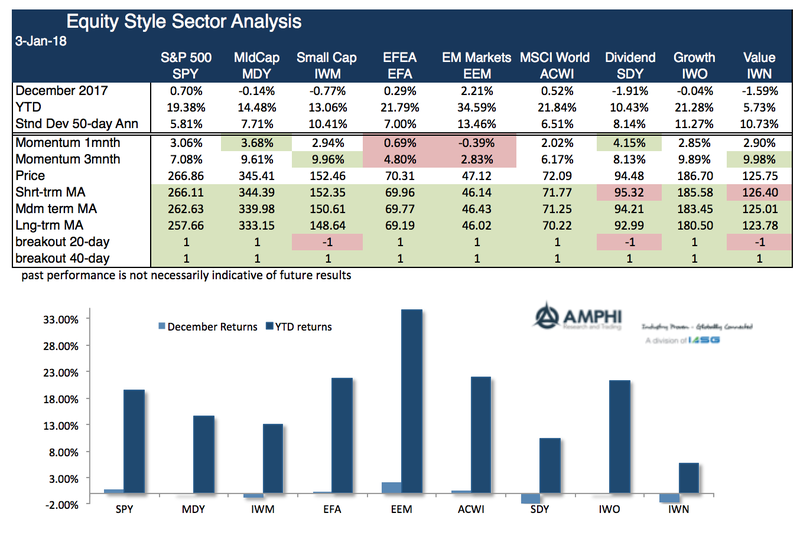 Mid and small cap US underperformed during the year in spite of the resurgence in economic growth. The worst performing style was defensive dividend focused. Value underperformed growth by a wide margin. Value should do better in an overvalued equity market while small caps should gain on the tax reform economic growth story. Right now, it is still a risk-on environment. 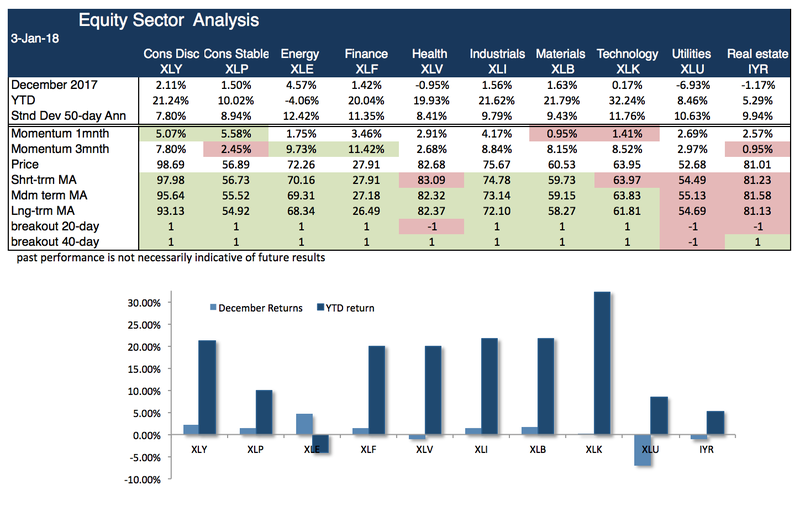 The dispersion in sector performance was over 35% with technology being the leader and energy being a laggard by a wide margin. Interest rate sensitive sectors also fared poorly with utilities and real estate both being below a 10% return threshold for the year. There were strong gains in cyclical industrial and consumer discretionary sectors especially in the second half of the year when growth surprises dominated behavior. The stronger trend in oil and the concerns about overvalued stocks suggest that the extremes in these sectors may switch in 2018. Cyclical performance should continue based on the economic growth story. Country returns were all positive for the year with the surprising winner being South Korea in spite of the geopolitical turmoil on the Korean peninsula. Europe and Asia generated similar returns. Commodity driven country equity ETFs like Australia and Canada underperformed on a relative basis and Mexico was buffeted by the trade war talks earlier in the year. Continued momentum in global growth suggests that global country exposures will continue to do well. Bond performance was strongest in international and emerging markets based on improved credit risk and dollar weakening. The strong long duration Treasury performance was surprising given the strengthening economic growth. Demand for yield from credit continues albeit less so for the high yield sector. Other bond sectors were flat for the year. Continued economic momentum tied with higher inflation expectations suggest that long duration bonds may be at higher risk than last year. As I often remind myself, "trends are innocent until proven guilty". While there are clear signal of overvaluation in both stocks and bonds, an immediate defensive portfolio may face a high opportunity cost for not being in the market.